The bodice of the dress is a solid color with a halter neckline, sleeveless design and a fitted waist that flows into a maxi length skirt. 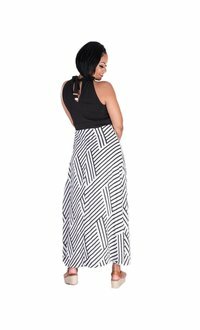 The maxi length skirt is created from a contemporary linear print with a slight flare at the ankles. Add even more glamour to this look with dramatic earrings and sparkly clutch from our collection to complete this look.